George and I just got home from spending three weeks with our daughter, Cathy, at her home in Florida. Rather than write about all the work George did for her, as he always does while we are there, I would like to write about our trip coming back home. We had to get up by 5 a.m. to leave for the Orlando airport to catch our plane home to Ohio. We were already packed and had a quick breakfast and left to catch our plane. Cathy drove us to the airport before it had began to get light outside. Anyone who has traveled anywhere near the airport, or Disney World, knows how bad the traffic is. With the growth of population being nonstop, it’s never an easy place to drive. Our first experience while driving at the speed limit on that busy highway was to have the car in front of us come to a dead stop! No slowing down, no warning, it just came to a dead stop. And, thank goodness, Cathy was able to come to a dead stop as well, and the car behind us was able to do it also. With her headlights shining on the black car ahead of us, we watched as a man opened the driver’s side door and got inside the car and took off. Since there were two cars ahead of us, involved in the stopping, we assume that he had gotten out of the car ahead and traded drivers. How they ever had the nerve to stop on that spot and risk a huge pileup, I’ll never know! So, with that memory in mind, we stepped up to the inspector and George handed him his piece of paper that was his temporary license until his regular one would be mailed to him. And the inspector said, “We don’t accept paper!” When we tried to explain that in Ohio, you only get a paper one until the real one comes in the mail, and it didn’t come until after we had left Ohio. He sent us to another line, same thing happened there, too. In fact the very same words, “We don’t accept paper!” And then were told to go over and see another person who was not behind a desk and had no uniform on. He looked at the paper and asked to see George’s old driver’s license, and then said, “Oh, yes, we deal with this all the time. You are fine. Follow me.” He took us to the handicapped line that had many people in wheelchairs, and we went right through just fine. In fact, faster than the regular line. You would think that my story about boarding would end there. But, not quite. As we sat down to wait until takeoff, we talked to another senior citizen couple across from us and compared experiences of having trouble with driver’s licenses. And, just as it was time for all four of us to board, the lady said to me, “It looks like there is a driver’s license under your chair.” So I looked, but only saw a candy wrapper under it. She said, “No it’s clear back there.” So, I got down on my hands and knees and got under the chair to pick up a white card. I was thinking that if this is a driver’s license, how happy the owner is going to be when they get it back. As I am getting out from under the chair to stand up, I looked at it, and it was mine! My driver’s license must have fallen out of my jacket pocket and fell down between the seat and the back of my chair to have ended up there. Now, that has to be all that happened. You think? I’ll just say that our two-hour, nonstop trip turned into a four-hour period of time. We were boarded and the engine was running, but we had to sit on the tarmac for an extra two hours, waiting and wondering what was going on. With all the news of airplane problems, it wasn’t a fun experience at all. After the first hour-and-a-half had passed and we thought we would get to take off, the captain said that now we had to get more fuel to be able to make it to Columbus. We never did know exactly what the hold up was. And later, he told us that there were eight to 10 airplanes in front of us and three behind us, so we had to wait our turn to take off. It had then been nine hours since having breakfast, and you know those pretzels and that little cup of coffee they give you just aren’t enough. During all this extra two hours of time, our other daughter, who was at John Glenn airport in Columbus to pick us up, sat in the cell phone lot, waiting and wondering what was going on, and why we weren’t calling her to tell her that we had landed. But, by 2 p.m., we saw her waving us down just as we got to the pickup lane. So, we jumped in her car and headed for Cracker Barrel on U.S. Route 36/state Route 37. What a relief to have some real food and be on land in Delaware County, Ohio. Yea! 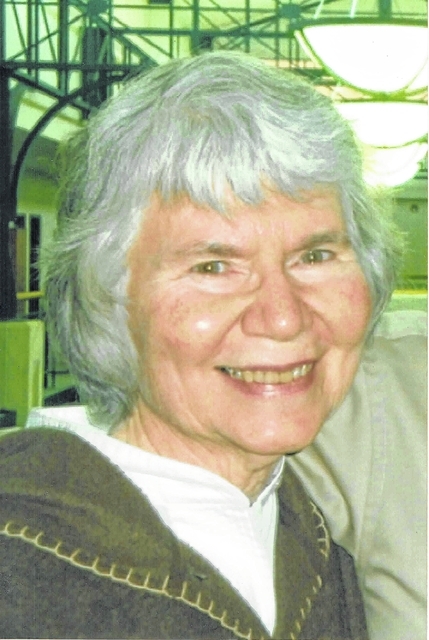 Kay E. Conklin is a retired Delaware County (Ohio) recorder who served four terms. She graduated from Ohio Wesleyan University with a degree in sociology and anthropology.